Lorenz Kunststoff GmbH is launching a new bulk moulding compound, BMC 0204, at the K 2013 exhibition.Lorenz Kunststoff adds that BMC 0204 is both highly flame retardant, as well as having a number of good mechanical properties that will benefit a broad range of applications. Developed in Lorenz’s own laboratory over a period of two years, BMC 0204 combines several characteristics in a single material. In its UL 94 certification test, 0204 achieved level V-0, despite a thickness of only 0.4 mm. 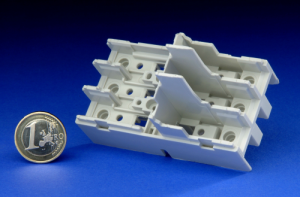 Lorenz Kunstoff adds that this makes it currently the only flame retardant plastic suitable for injection moulding with an oxygen index of 100%. The company claims that this value is twice as high as that of other plastics deemed as extremely flame retardant. The BMC fulfils a wide range of fire safety standards and has already been awarded several important European certifications. For example, it has been classified as I0 / F0 / M1, the highest level of the French NF F 16-101 standard. In addition to its flame retardant properties, BMC 0204 is also resistant to temperatures as low as -40°C. BMC 0204 also offers a flow rate of at least 1000 mm in the flow spiral at 100 MPa. This means that it is suitable for production of both large-dimension and fine-wrought components. The low injection pressure required for processing facilitates insert moulding of sensitive electronic components and sensors. BMC 0204 also has a CTI value of 600 V and a thermal conductivity of 1.35 W/m K, which makes the material suitable for electronics applications, particularly for the production of connection boxes, circuit breakers and fuse strips, as well as in domestic appliances. The material is free of halogen, chloride, cyanide and bromine, and is suitable for printing or laser marking.